Are Your Kids Early Morning Wakings Derailing Your Sleep? Tips to keep your kids in their own room and out of your bed. Courtney R. Zentz, In the business of helping children to get the sleep they need to grow & flourish. As the owner of Tiny Transitions Sleep Consulting, sleep IS my job. 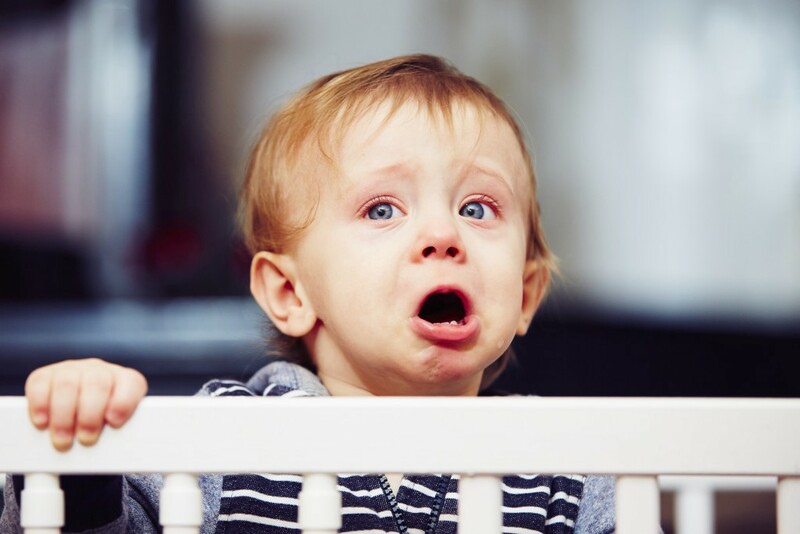 A child upset in his crib and over-tired. Here it is, 4:30 am and the pitter-patter of little feet come shuffling across your bedroom floor and over to your side of the bed, “Mom, I am awake” is quietly whispered in your face at point-blank range. Better yet, the monitor starts erupting with slowly escalating cries, to which you jump up and think to yourself “is this kid really getting up now?” and pull yourself out of bed to go retrieve them. This is an all too common occurrence for many families and there are often a few things that are contributing to this that with some minor adjustments, you can have worked out in just a few days, so everyone is getting the rest their bodies crave. Bedtime: Try adjusting your child’s bedtime to between 15 and 30 minutes earlier. A leading cause of early wakings is actually going to bed over-tired & too late. Sounds counter-intuitive right? Trust me on this one. Naps: Be sure to understand the appropriate nap-time for your child, so that the nap or naps are properly spaced out throughout the day and ensure a child is going into bedtime well rested and can get the restorative sleep they need. Habit: If for the past few days when your child wakes you go right in and get them, they actually believe it’s now time to get up. So first, stop doing that and then get them an “OK to Wake” clock at your local store. Use this to explain that once the lights on, it’s time to get up. Reinforce those first few days by giving them 10 minutes to settle themselves and if they don’t, go into their room, point to the clock, tell them you will be back to get them when the light is on and leave the room. While this will likely be met with protest, after a few days the protests stop, as they understand that it gets them nowhere and they lay down and go back to sleep until that light comes on. We know the mountains of evidence and even the stories you read daily on Thrive that discuss the importance of sleep for everyone. It’s time you take control, take back your sleep and give your little one the chance to take back theirs. They will thank you for it with a healthier appetite, less temper tantrums and much more time to snuggle and play… life is precious, no one wants to spend it in time out.